Camperite has been trading selling tents for over 40 years from its location in Marks Tey near Colchester. The accessory shop is always being improved and a large extension was added to allow more space to stock those all-essential bits of equipment. Outside there is space to erect up to 30 tents with a mixed range of Kampa, Vango and Coleman so that customers can have a good look round and see the models performing in realistic outdoor conditions. The business owner David Broughton has been in the camping trade for over 28 years and worked some of that time as a sales representative for one the major tent suppliers and then left to go and join a retail shop as manager and also for two years ran the biggest camping shows in the country for a London based retailer. David saw the golden opportunity of owning Camperite Leisure as one not to be missed. David hopes that he is able to provide a personal level of service that sometimes now seems to be missing from some of the bigger camping shops and online retailers with specialist knowledge to make any customers family camping and caravan holiday complete. If you want to see how we understand and believe in customer service then please feel free to read our testimonials here. A year after David started at Camperite one his customers sons came to start work with him as a Saturday lad at the tender age of Fifteen. Now 16 years on Tom Davies is a full time member of staff and has all the knowledge to help customers. 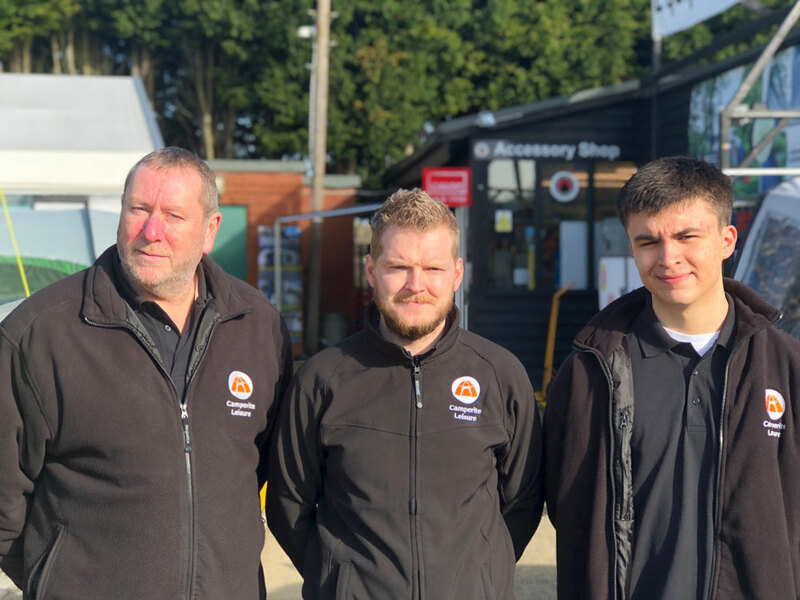 Tom has attended training courses with Outwell and Vango and gained accreditation's and as a company we have been awarded Kampa Dealer of the year. 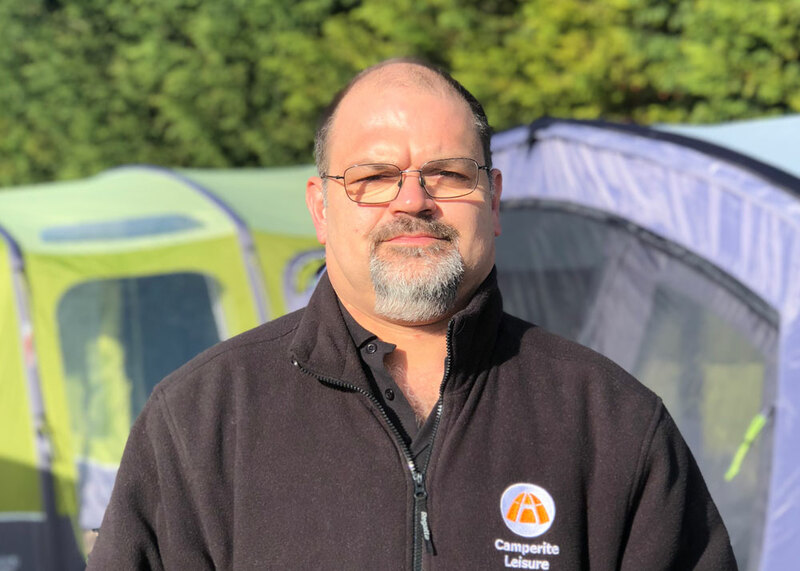 In 2015 we were joined by John as our third full time member of staff and brings with him 40 years experience in the outdoor and camping industry and Camperite has diversified to offer more products for our caravan customers including the latest inflatable awnings and more caravan accessories along with our continued extensive range of camping equipment. So between the all the staff we should be able to help and have the answers to all your questions with over 85 years experience between us. We have also been made a Kampa Premium Dealer for the large range of accessories, tents and awnings we stock from this company. Although not the biggest shop, with David’s long experience in the trade he has been able to secure excellent deals with suppliers which allows him to offer very competitive pricing but still maintain that personal element of service and advice. I hope you find us friendly, competitive and helpful. Please feel free to give us a call and try our service. Our website is open all year for orders. Late nights during the weeks can be arranged for any customer if coming from a distance just telephone us first on 01206 210551 to make an appointment! We are conveniently situated on the main A120 just a few hundred meters from its junction with the A12. If you are coming from the A12, please exit at the slip road signposted Braintree and Marks Tey The A120. Upon joining the start of the A120 look on the right hand side for the entrance to our car park and our blue sign with our logo by the gates. The entrance is immediately after the pedestrian traffic lights. We are located behind the shed centre. There is the option of getting a number 70 or 70X bus to Chelmsford via Braintree, Great Leigh's from the stain bus stop or the 71A, 71C, 71X to Chelmsford from the bus stop a little further away over the footbridge taking a route to Chelmsford following the A12 and lastly there is a 83 service from the station going to Colne Engaine.